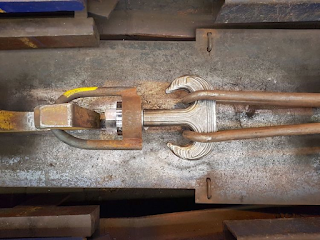 Safety Central: “Additive Manufacturing” of Hooks – Good Idea? 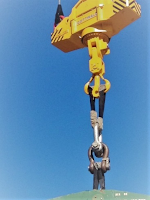 News on inspections, training, load testing, and information on the crane industry. “Additive Manufacturing” of Hooks – Good Idea? Fascinated, when in 1984 I learned from a science magazine that a photo of a Statue Bust of Benjamin Franklin was taken in Cambridge, England and faxed to a laboratory in Massachusetts. 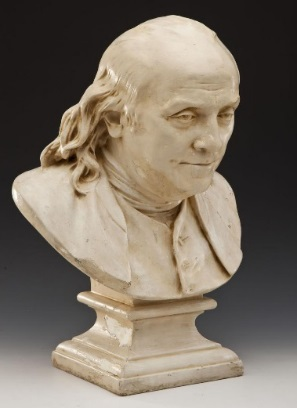 Then, it was turned into a 3D CAD digital file which was loaded into a “molding printer” where it started to duplicate the bust of “Ben” - as a plastic replica, amazing. 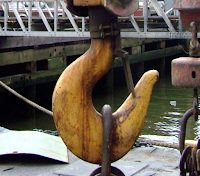 Now in 2018, I learn of a comparable process of producing a crane hook, that caught my interest. This process forms an object layer on layer. I thought it was a neat idea for ole Ben’s head but, for a crane’s load hook I have questions. As one who for about 45 years inspected and tested port cranes, I know that the hook supports all that is below it, no doubt critical to safety. Well, why is it called 3D printing anyway? If you were to look at letters being typed on a page with a microscope you would see that the letters sit “on top” of the page, not stained into it. If you were to print over the same spot with different letters the area would build-up to form a three-dimensional object of a complex shape by the addition of each printed letter, letter by letter. 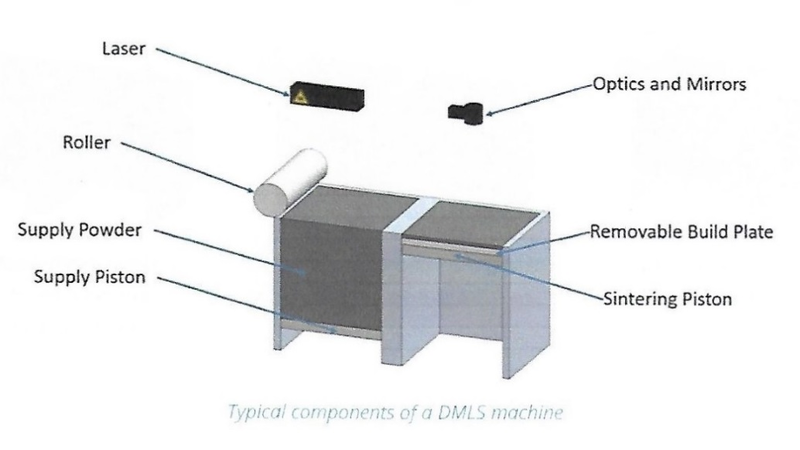 The “3D Printing” process technology started about 1981 and still is being performed using these basic steps. 1. SCANNING - with 3D capabilities of making a virtual digital document of a drawing or object by locating digital points along it’s X, Y and Z axis, thus creating the digital copy of a solid object in a document file that can be distributed. A CAD file using a 3D-modeling program will create this file. 2. DIGITAL SLICING - this digital file is loaded into a computer having programs that turns the data into what could be thousands of thin cross-section digital layers. When the layers are stacked upon each other they will form the 3D replica. Then this digital message is loaded in an external “printer”. 3. 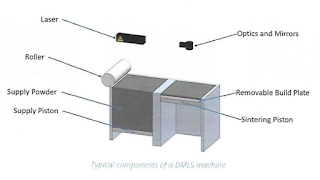 PRINTING - Processes vary, a computer file then guides the printer’s robotic arm that lays on a liquid material in the prescribed pattern on a “product bed”, from the bottom-up, that instantly hardens the material forming a solid layer. The next layer is placed on top, layer on layer, till the object is duplicated per the digital instructions. 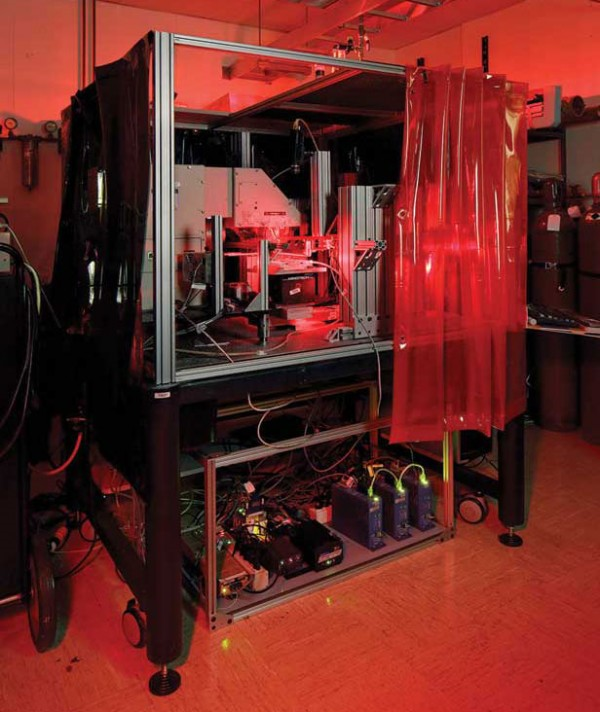 The 3-D printing started out in a laboratory using poly-based plastics that used very complex and expensive machinery at a university. Thus, ideas about how and where to use the new technology spread slowly throughout industry due to cost. The process, not only expensive but, the materials used were not strong and limited to “gadgets”. These steps were at first three separate functions on different machines or even countries. Currently, all these functions are available in one low-cost unit suitable for the private-public to experiment. 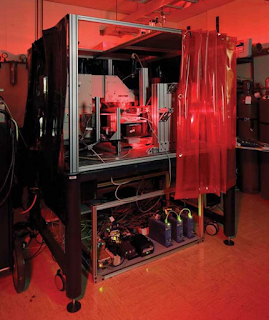 Three major machine improvements took place through the years allowing many people to research with uses of the 3D printing process. Therefore, new ideas and products arose. Now, products from plastics, cement, to the hardest steels are being used to manufacture structural components or gadgets at or below, current prices. Processes in printing of objects today to produce the 3D image and duplicate an object are evolving. The term Additive Manufacturing (AM) starts with a flat surface and builds up the object layer on layer. Developers feel this process of “adding” material more accurately defines the difference between taking a picture and producing an object (Ben’s head) vs. adding material to build-up an object (a hook). Additive manufacturing is only using the material you need, as opposed to Subtractive manufacturing, which involves cutting away what is not needed from a large casting. In 2010 ASMT defined seven categories of Additive Manufacturing. Spray methods of building up material into objects are still used. To form plastic parts and decorative items. Structural concrete components for the construction industry use these spray methods. Another method starts by spreading a thin layer of powered metal on a bed. Then using a laser, it welds the power into a solid layer of material on the bed, and then another layer is applied over that layer. The process is repeated until completing the object. There is a possible risk of the material not being fully fused during this “power” process. 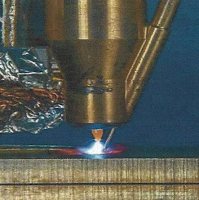 Fusion welding which deposits metal to form 3D shapes by aiming a Plasma beam or Laser to achieve desired fusing results. Also, Wire & Arc using a GTAW or TIG power source are methods employed. This latest technique has replaced some casting/machining products manufacturing, ships propellers (wheel). At times in cast objects, 70% of the material is removed to form the item, a huge material cost. This savings is one major reason driving this method as well as the stronger objects (hooks) being made. The fusion zone and surface are subject to oxidation with some alloys and demand additional inert gas protection. Portal seals can be placed over the work area and filled with inert gas for protection against contamination. Some draw-backs remain with “printing”. The process is not cost effective for some items; it cannot compete cost-wise with mass-produced items on the production line, yet. Also, the smooth finishes necessary for some products are not achieved. Likewise, the variations in material types necessary are not available. Still, they are working on it, and the process is sprouting. Steel Duplex hooks have been made by a Cast/machined process. 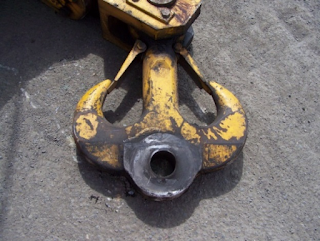 A two-prong duplex hook cannot be forged as a Bowl hook is, they are cast and machined. A word about PLASMA, it is one of the four fundamental states of matter (plasma, gas, liquid, and solid). But plasma does not occur naturally on earth. It takes an electrical current or a strong magnetic field in a vacuum to strip or add electrons from an inert gas to place the molecules in the “Ionized” state, charged particular = plasma. When these forces are removed the “freed” electrons emit light returning, and the molecule reclaims its normal state. However, plasma is familiar to us as in neon light tubes, the Northern lights in the sky, plasma TV or the “free” nitrogen released during a lightning strike. When welding with a plasma beam (which is like a little rocket engine), the chamber inside the torch forms a vacuum heating the inert plasma gas that expands. The hot plasma ions gas rushes out the nozzle and can be precisely aimed. Because all this takes place inside the nozzle, there is no need for a vacuum chamber to produce the plasma state of the inert gas. The process of building up steel by welding has been around for a while, in 1926, Baker-patented the use of depositing molten metal in superimposed layers to build-up objects. We all have seen multi passes welds on weldment to achieve the necessary strength in the structure. Duplex Port Crane hook using a 3D printing technique. Termed “Wire & Arc Additive Manufacturing” (WAAM) process which utilizing a wire feed and plasma Arc to produce the midsize hook. WAAM process of Manufacturing is in some sense – special. The directions to the robot wheeling the Arc welder are the same as those in numbers 1 and 2 above. 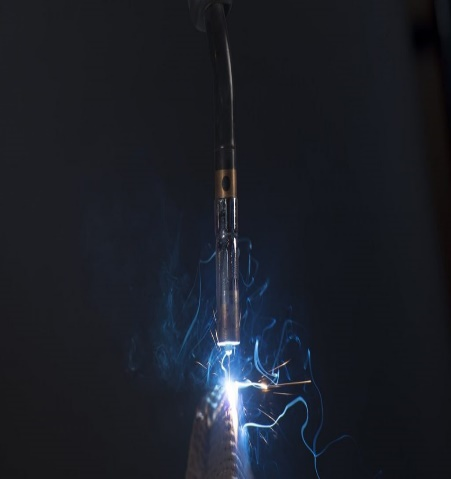 In step 3, the layering of the hook utilizes the Arc and Wire feed welding process which is hotter (10,000 to 20,000 degrees c) than carbon arc or laser to build-up the hook. This allows stronger materials to be used. The Caterpillar Tractor Corp. is currently producing aftermarket parts using the AM method which are more cost-effective than starting up old production lines that no longer produced the part. One component which is manufactured new parts is a complex gas turbine nozzle which is used in their production equipment. It is becoming cheap and easier to 3D manufacture metal parts, if widely adopted, it could change the way we mass-produce many products. Livermore National Laboratory announced they have 3D printing method for stainless-steel parts twice as strong as traditionally made one. 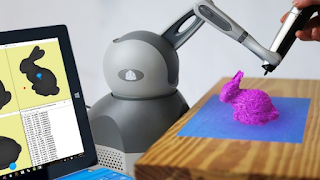 Markforged, a small startup, outside Boston, released the first 3D metal printer for under $100,000. Desktop Metal also in Boston, began to ship its first metal prototyping machines in December 2017 that are claimed to be 100 times faster than elder metal printing machines. GE, which has long been a user of 3D metal Additive Manufacturing has a test version of its new metal printer fast enough to make large parts and plans to start selling them in 2018! Even outer space is an option, NASA has challenged with a $250,000 prize to a company who can adapt 3D additive manufacturing technique for robots on Mars to build habitat designs to eventually house humans’ explorers on the planet! On the material side, they say the problem is solved. All we need now is a nozzle that is a little more “forgiving” to spray the material (may already have it). I guess, “the sky is the limit”. 1. The process of layering, how is 100% adhesion between layers assured? 2. In use when loading/unloading flexes hooks, will layers delaminate? 3. What type of NDE method would be appropriate? 4. What visual inspection dimensions are assigned? 5. Are the Hook Manufacturer’s data sheets available? IS HOW THE OPERATOR OPERATES THE CRANE CAUSING DAMAGE TO THE CRANE? OSHA extends operator's certification requirement for 3 years.